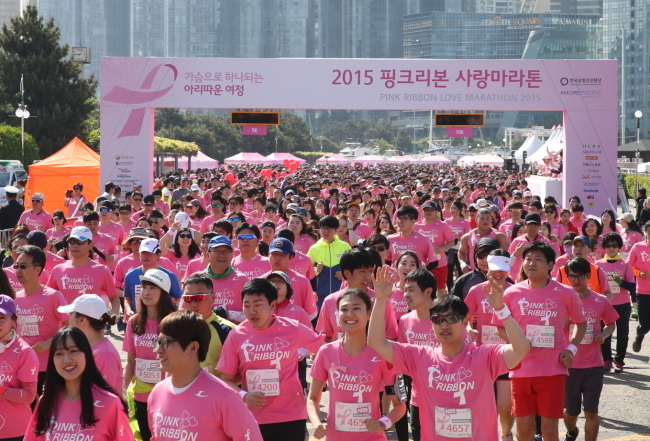 South Korean cosmetics brand AmorePacific and the Korea Breast Cancer Foundation kicked off the Busan leg of this year’s Pink Ribbon Love Marathon on Sunday. The annual event aims to spread awareness about breast cancer ― the most common form of cancer in women ― and raise funds for low-income breast cancer patients. Over 5,000 men and women gathered at the Busan Yachting Range to take part in the race, which is celebrating its 15th anniversary this year. The Sunday event featured various sponsored booths that offered participants free breast cancer consultations and informed women about how to conduct self-exams. The breast cancer marathon will continue as a nationwide relay event over the coming months, as thousands of runners are set to participate in the race in Daejeon on May 17, Gwangju on June 14, Daegu on Sept. 13 and Seoul on Oct. 18. Since launching in 2001, the marathon has seen over 254,000 participants and raised over 2.6 billion won ($2.4 million). The funds were delivered to more than 780 low-income breast cancer patients and used to sponsor around 700 public lectures on the leading cause of cancer in women, according to AmorePacific. For more information on the Pink Ribbon Love Marathon, visit www.pinkcampaign.com.